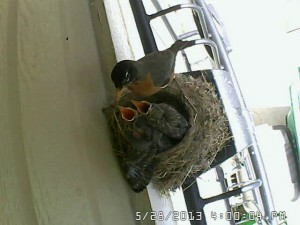 We continue to monitor the “NEV-CAL Robin Cam” and friends of NEV-CAL have told us they love watching the live feed. Nature moves fast and the chicks are getting bigger every day. We soon expect to check the cam and find the birds have flown, but in the mean time, here is a snapshot from earlier today.